Fakelaki means "little envelope" in Greek. As in a little envelope full of cash, given to a doctor in exchange for good care. Sadly, it's a staple of the country's health care system. "There are some doctors, even public health care doctors, who directly ask for money," Maro Kouri said. "They ask before running tests, they ask when you are supposed to get your results back," she said. Fortunately for Kouri, Evangelisimos hospital in Athens is the exception. Kouri was with her father at Evangelisimos. The day before, he had what felt like a heart attack and drove from his home town two hours away. "In this hospital, doctors don't ask for money, this is a great hospital," Kouri said. That alone illustrates the sorry state of Greece's hospitals. In fact, experts say the country's health care system is on the brink of collapse. Government health spending fell 25% between 2009 and 2012, after the country's 2010 bailout package capped such spending. Spending on drugs dropped by 32% since 2010. And the country owes international drug makers 1.1 billion euros ($1.2 billion), according to the European Federation of Pharmaceutical Industries and Associations. 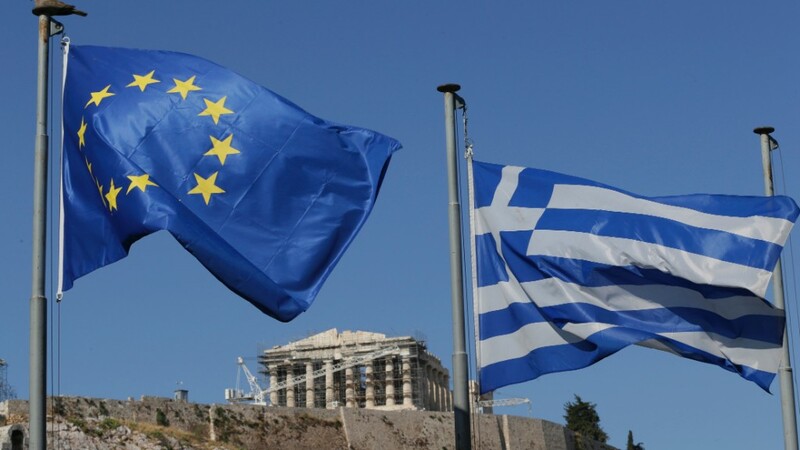 With the country running out of cash, international organizations are warning that Greece could face medicine shortage within weeks. Evangelisimos is the biggest hospital in Greece. With 1,000 beds, it is constantly running 10% to 20% over capacity. The hospital resembles a massive maze, with tunnels and walkways connecting seven huge buildings. The narrow corridors are lined with patients in beds, most of them elderly people hooked to feeding tubes. Some are sleeping, others just stare into the ceiling. They are waiting for hours for rooms to become available. "There is just too many patients and not enough rooms," trainee nurse Anastasia Karkasina said. Karkasina is three months away from becoming fully qualified. She is worried about getting a job. "There are no available positions, because there is no money to pay for them," she said while taking a short break with fellow trainee Anna Karafoti in the sizzling heat outside the hospital. If the two manage to get jobs, they can expect monthly salaries of about 700 euros ($780). 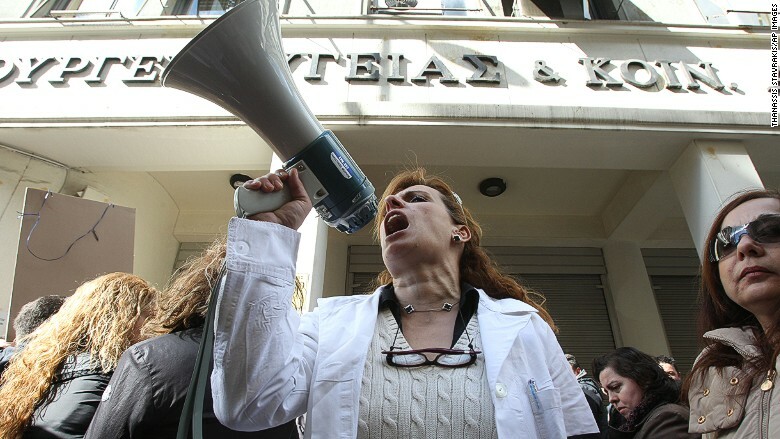 Staff at Evangelisimos hospital in Athens opposes any more cuts. Another young client of the hospital, 20-year-old Rigelda, sat waiting at one of the empty hospital beds on the fifth floor of the hospital. She came to the hospital with her mother, who -- she said -- "took too many pills." Her father is currently unemployed, so the atmosphere at home is tense. "My mother is a very emotional person. In Greece, right now, even very small things can make you feel hopeless," she said. The number of suicides in Greece has increased. According to the British Medical Journal, the overall suicide rate rose by 35% between 2010, when the economic crisis first hit the country, and 2012. The family traveled to Evangelisimos from Glyfada, which is around an hour away, because their local hospital wasn't accepting new patients. 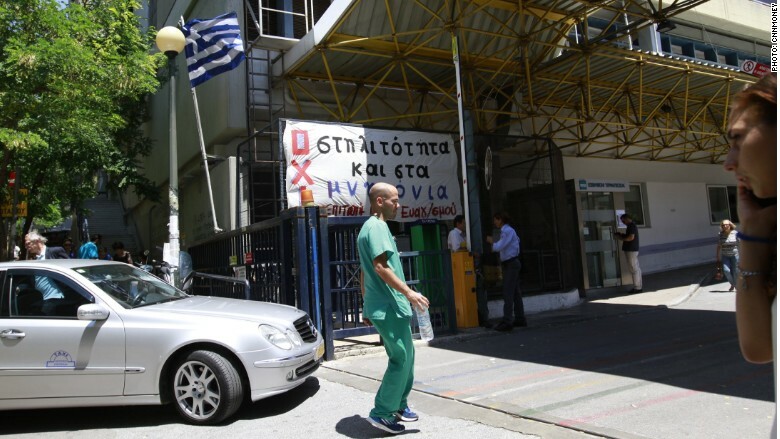 Hospitals in Greece often have a policy of only accepting patients on "emergency days," two or three times a week. If it's not the right day, people who need medical attention have to travel to a different hospital. The influx of patients puts extra pressure on the already struggling health care staff. Surgeon George Kolovelonis works 10-hour shifts five days a week at Evangelisimos. Every couple of days, he is on call for 24-hour periods. His job is getting busier and busier. "The number of patients is increasing, because people are no longer able to afford private care," Kolovelonis said. Yet Kolovelonis' pay was cut from 2,200 to 1,500 euros a month in the last four years. On average, he performs three surgeries a day, spending six hours in the operating room. On Sunday, he was doing breast cancer and bowel cancer operations and took a moment out for a Greek-style iced coffee and a cigarette -- Greece has the highest smoking rate in Europe. "But don't get me wrong," he said between the sips, "I really, really like my job."